On December 31, 2012 the Mortgage Debt Forgiveness Act of 2007 is scheduled to expire. As a San Jose Real Estate Agent-Broker, who manages many San Jose short sales, I recommend signing the petition to extend the Mortgage Debt Forgiveness Act of 2007. “The Mortgage Debt Relief Act of 2007 generally allows taxpayers to exclude income from the discharge of debt on their principal residence. Debt reduced through mortgage restructuring, as well as mortgage debt forgiven in connection with a foreclosure, qualifies for the relief. How does extending the mortgage forgiveness and debt cancellation act help homeowners who want to avoid foreclosure with a short sale? Upon completion of a short sale, lenders issue homeowners a 1099. Simply stated, the loss to the lender on a short sale becomes the gain, or income, to the homeowners. With mortgage forgiveness and debt cancellation the income realized by a modification of the terms of the mortgage (short sales modify the terms of a mortgage) is excluded. In other words, the debt relief act allows the exclusion of income on certain cancelled debt on a principal residence. Mortgage Forgiveness and Debt Relief relates to taxes. Therefore, to fully understand if you qualify to exclude income on cancelled debt on a principal residence, you definitely need to consult with a licensed tax adviser who is well versed in foreclosure tax laws. San Jose short sale agents are not licensed to give tax or legal advice. IRS Publication 4681 – Rev. 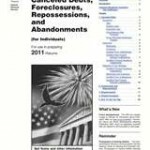 1/24/2011 – Cancelled Debts, Foreclosures, Repossessions, and Abandonments (for individuals) in preparing 2011 Tax Returns. Avoid Foreclosure – get the help you need now! Call San Jose short sale agent, Kathleen Daniels today for a free consultation!